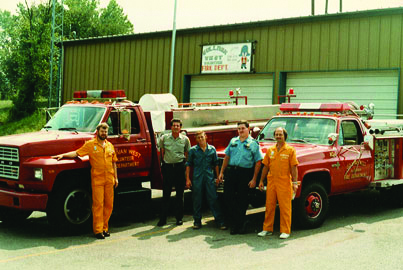 The Sullivan West Volunteer Fire Department is a fire, rescue and medical first response organization located just outside of Kingsport, Tennessee in Sullivan Gardens. We are a proud member of TARS and the Sullivan County Volunteer Fireman's Association. Annual water usage - 507,000 g.
Feet of hose on-hand - 6,900 ft.
Yosemite Sam has served as the department's mascot since the department opened, when one of its members took it upon himself to paint the Looney Tunes character on the side of a truck and later on the department's sign. The opinions of the paintings were mixed, however both were left and remained for years. The truck was eventually sold and sign taken down, but the paintings didn't escape the memory of the those who'd grown up around the station. Years later, in 1992, members saw to it that "Sam" returned when they redesigned the department's patch. Yosemite Sam is painted on the side of the door. The original version of the patch featured the character in a red helmet with yellow gear. His outfits have changed over time to reflect the changes in gear style and color trends. In 1974 in response to a need for adequate, non subscription, fire protection. Before this time, the community was protected by a subscription fire service, which meant only those who could afford the service had fire protection. In the beginning, the department operated from an old service station just off highway 93, but soon built a more adequate building next to Sullivan Elementary and the Sullivan West High School, on Rosemont Street, where it is located today.